The proto Eastern Polynesian word from from which the Mäori tree name kawariki originated seems to have denoted the tropical "umbrella tree", Terminalia catappa, a meaning retained in cognate words in other Eastern Polynesian languages. The word seems to be derived from the Proto Polynesian words kau "wood, timber" and ariki "chief", and it is possible that one of the meanings still retained in modern Samoan, "a chief's word", was its original meaning. Be that as it may, the Terminalia's large leaves have a counterpart in those of the Coprosma species which received its name in Aotearoa. The names manono and kanono (only Maori has the alternation of "m" and "k" for the initial consonant in this and a few other words) are derived from a Proto Polynesian word, *manono, denoting a tree with medicinal properties, Tarenna sambucina, classified by botanists in the coffee family (Rubiaceae). The reflexes of this word have retained that meaning in many Polynesian languages; in some, like Mäori and Hawaiian, they refer to other members of this same botanical family with similar attributes. The Tahitian and Marquesan forms refer also to other plants which are reminiscent of the Tarenna. Coprosma grandifolia grows in moist, sheltered places in the forest, and is found in the Three Kings Islands as well as the North and South Islands. The leaves are large, up to 20 cm long and 10 cm wide. The tree itself reaches from 4 to 6 metres in height, much shorter than its tropical namesakes. A yellow dye was obtained from the bark; Murdoch Riley notes that scrapings of kawariki bark were bound with harakeke (flax) around whalebone patus, which were then baked in a hängi (earth oven) to give a yellow shading to the weapon. Like the tropical manono, an infusion of the inner bark in cold water was used to treat sprains and fatigued limbs. An infusion of bark and leaves was used to treat broken limbs; the leaves themselves were also employed for this purpose. 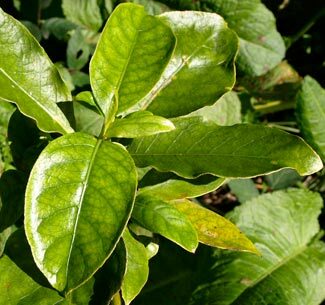 The bark and sap were also effective in treating cuts, bruises and skin disorders. Note: See linked page for the Proto Form *kaualiki for a discussion of the Samoan cognate. Further information: There is general information, along with good photographs of the fruit, flowers and leaves of Coprosma grandifolia, on the NZ Plant Conservation Network's web site. The Bushman's Friend web site has a very nice presentation on New Zealand species of Coprosma, complementing the treatment in John Dawson's book (see link below). Some (perhaps all) species of buttercup (Ranunculus) are known generically as "kawariki". In this case the name is probably simply a variant of other common names for these plants, raoriki and waoriki, and not derived from Proto Nuclear Polynesian *kaualiki. 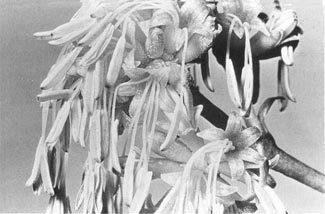 Sources of photographs: The photograph of the male flowers of the manono is by M.D. King, from the electronic version of John Dawson's book Forest Vines to Snow Tussocks: The Story of New Zealand Plants. 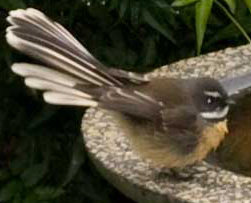 The other photograph is of a kawariki seedling in Te Mära Reo.